As I type these interview questions, distributors are getting ready to mail your gorgeous picture book, The Mermaid and the Shoe (pub. date: 4/1), to bookshops and libraries. How do you feel right before one of your books is sent out into the world? K.G. Campbell: The time lag between creation and release is such that by the time a book is launched, most of my time and emotion in heavily invested in a new project. Perhaps then, I don’t spend as much time thinking about a book’s debut as I should. But when I do, there’s always an element of apprehension fueled by that insecurity suffered I suspect, by most creators. Will they like it? Will they hate it? I’ve been pretty lucky so far, but I’m always bracing myself for negative reaction. It feels inevitable. I’m guaranteed a great conversation whenever I drop by the Kids Can Press booth at ALA Annual. I don’t usually enjoy reading picture books in a noisy convention center, but they encouraged me to read Lester’s Dreadful Sweaters. I’m so glad I listened to them. It is brilliant, original, and funny. I walked away from the booth with the biggest smile on my face. Was Lester always named Lester? How do you usually go about naming a character? K.G. Campbell: I like my picture books to have a certain “readaloudability”. If there’s a particular word that’s central to the plot (say, sweaters) I’ll hunt down a name that shares a syllable, or several letters; a (very) soft rhyme I guess. Had Lester been released in Britain for example, it might have been titled Humphrey’s Ugly Jumpers. In other cases I’ll pick a name that conveys personality. In adult fiction (outside of Dickens), this can seem a little corny. But within the tight confines of a picture book, it can be an economical tool for communicating character (and in the case of my mermaid Minnow, setting too). OK, OK, I know minnows are mostly freshwater fish, but Halibut just didn’t sound the same. Congratulations on receiving an Ezra Jack Keats New Illustrator Honor Award for Tea Party Rules. Ame Dyckman’s text and your illustrations crack me up. What about Ame’s manuscript made you want to illustrate the story? K.G. Campbell: The ability to construct an entire story arc with conflict, resolution and character development in under 400 words requires a kind of genius. In my own writing, I really struggle to keep things simple, but Ame does it brilliantly. While it packed some punch, the Tea Party Rules manuscript still felt airy, for want of a better word. It left so much room for an illustrator to be creative and have fun (like adding walk-on parts for fat cats etc.). I left a lot of white negative space so the reader would concentrate on the characters’ emotional journeys; the visual equivalent I like to think, of Ame’s manuscript. I love EVERYTHING about Flora and Ulysses: The Illuminated Adventures. Is there a character or a scene that resonates with you? K.G. Campbell: I’m a Spiver fan. He’s clearly an old soul, his short life having already left him prepared for the worst. I think the hysterical blindness and his intellectualism form a shield to protect him from the world. He’s been hurt and he seems lonely. I feel for him. I’m glad he finds safe harbor at Tootie’s and a friend in Flora. One of my favorite lines is in chapter twenty-one. After Ulysses has written his first poem, Flora asks William if he doubts him. William replies “Of course I doubt him!” It’s a simple statement, but in its candor there’s a wealth of humanity and cynical humor. It made me like him even more. Picture books are like literary appetizers; small, gorgeous and delicious enough to whet the young appetite for further reading. Sorry, I found it hard to say something profound here without sounding horribly pretentious. Why did I feel the need to say something profound? I have no idea. And now I’ve exceeded my single sentence and utterly failed the task at hand. Thank you, Keith! See you at ALA Annual! Keith G. Campbell was born in Kenya, but raised and educated in Scotland. He graduated with a Master’s degree in Art History from the University of Edinburgh. After trying on several careers, Keith eventually returned to his early passion of writing and illustrating stories. 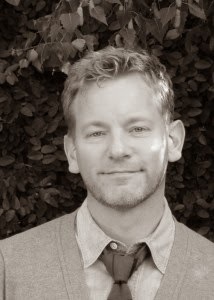 He is now a full-time author/illustrator and lives in California. 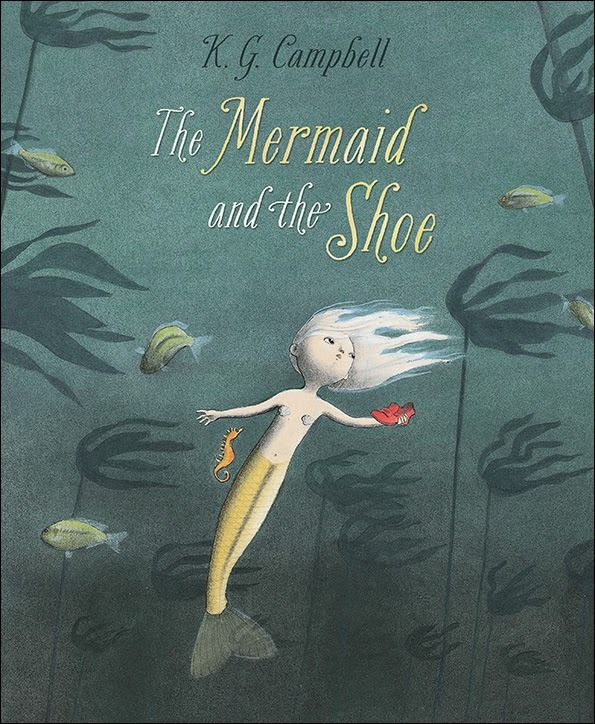 I am giving away one copy of The Mermaid and the Shoe. 1. It will run from 3/16 to 11:59 p.m. on 3/18.